A girl's emotional connection to her mom never stops evolving, even decades after the mother dies. Sometimes the thing that was fraught in a mother-daughter relationship later turns out to be a source of strength. 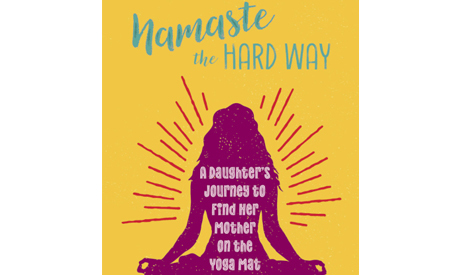 Such is a theme in Sasha Brown-Worsham's memoir, "Namaste the Hard Way." Brown-Worsham chronicles her coming of age, from a young girl growing up in an upper middle class neighborhood near Dayton, Ohio, to her adulthood living with a husband and children in the suburbs of New York City. As a child, Brown-Worsham was embarrassed by her mother's Sanskrit chanting, middle-of-the-day yoga poses and flowing linen pants. But as an adult, long after her mother's death from cancer, Brown-Worsham gravitated to the very thing that pricked the unease of her adolescence. Yoga became the way she reconnected with the mother she lost as a teen. Yoga helped her heal. "I am playing with discomfort on my mat so I can deal with what happens off the mat as well," Brown-Worsham writes. The book was conceived following a widely shared essay that Brown-Worsham wrote for The New York Times titled, "Not my Mother's Yoga." The author works in her own adventures in parenting and how having children helped put her mother in a more favorable light. "There is danger every day of turning a dead woman into a saint, of making my mother into someone with no flaws ... even 24 years after her death," she writes. "I am still chasing her ghost and it's not because she is a perfect human or mother."